Outline: From Matthew and Mark. 24 sections. It has a picture book to go along with the recording. (We have heard many stories about the people of Israel. God chose the people of Israel as His own people. God gave His Word to them. He told them what they should do if they wanted to please God. He also told them that one day He would send a special person to help them. This special person would save them from their sins. The people of Israel waited for many years. Then God sent His own son, Jesus Christ, from Heaven to come and live on the earth). Jesus came as a little baby and grew up among the Israelite people. When He was a man He began to teach the people about God. Jesus travelled all over Israel teaching the people. Jesus chose twelve men to stay with Him all the time. They were His disciples (friends). Jesus spent much of His time teaching His disciples, as well as the many people who gathered to listen to Him. He used stories that the people could understand and remember easily. (Jesus taught the people in the temple (big house of God) in Jerusalem, and in their smaller meeting places (synagogues) in the villages. Jesus also taught the people in their homes, out in the street, by the seashore, and on the hillsides. He went everywhere to make sure all the people heard His message. At one time Jesus went up on a hillside and taught a large crowd of people, including His disciples. This is some of the teaching He gave them. "People who recognise that they are spiritually poor and come to God for His help are truly happy. They are the people who are in God's kingdom. People who mourn and sympathize with others are also happy, for they themselves will receive comfort from others. Humble unselfish people are happy. They know they receive all of God's promises. People who sincerely seek to be just and good are happy because they will find that they achieve their goal. Kind and merciful people are happy, for they find that other people show kindness and mercy to them. The people whose hearts are pure (right in God's sight) are happy. (Their hearts are right in God's sight and they just keep on doing the things that please God.) They are the people who will see God. The people who work for peace (between other people) are happy. God (and other people) will call them God's children. Some people persecute (do nasty things to) other people, simply because they are doing good. The people who are doing good can be happy, for God's kingdom in Heaven belongs to them. The people who listened to Jesus were amazed when they heard this teaching. They realized that Jesus was not an ordinary teacher. Jesus spoke with authority. He was a teacher who had come from God. (He taught the people that he was the Son of God, and that he and his Father were one.) Many people listened to Jesus' teaching and wanted to follow him. They wanted Jesus to be their King. But Jesus said, "I didn't come to be a king of this world. My kingdom is in Heaven. I am king of all the people who follow me." But this teaching is not only for those people, it is for us too. If we want to be truly happy then we need to obey all of Jesus' teaching. We need to follow Jesus and make Him our King. Jesus talked about a man who was (very) wise. This wise man built a house for himself. (Sound effects: house building.) He built the house very carefully, and he built it on a rock (firm foundation). Later on a fierce storm came upon that house; wind rain and floods. The storm raged but the house stood firm upon the rock. Jesus said that people who hear this message and do what He says are like this wise man. Jesus also talked about a foolish man. This man also built a house for himself. (Sound effects: house building.) But he did not build it carefully; he built it on (some soft) sand. Later on a fierce storm came upon that house; wind rain and floods. 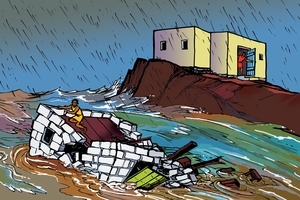 The storm raged and the house fell with a great crash, because it was only built on the sand. Jesus said that people who hear His message but do not do what He says are like this foolish man. (Change to first voice again.) Jesus talked about a fierce storm and floods. These are like the troubles and difficulties that come to each one of us. If we know Jesus and obey His teachings, then these troubles and difficulties will not overwhelm us. Jesus gives us the power to overcome these troubles. Also, if we have asked Jesus to take away our sins, then God has forgiven us. We will not be punished for our sins. God will not send us to hell. But if we turn our backs on Jesus and his teaching, then we must face all our troubles alone. Jesus cannot help us. Also God must punish us for our sins, and when we die He will send us to hell. Think about this story and decide if you are a wise foolish person. No one likes to sit in the darkness on their own. Sometimes if we are in the dark we are frightened. We think of the many evil things that are done in the darkness. People steal things from others; people try to kill or hurt others, and many other bad things. The world around us is a dark place when people do not know God. It is good for us to know that Jesus is the light of the world. If we ask Jesus to come into our life (heart), then He fills our hearts and minds with light. We do not feel bad about our sins because Jesus has forgiven us. We can understand God's Word because His Spirit lives in us and teaches us. This is why Jesus says to the people who are His disciples, "You are the light of the world." So, if we are the light of the world, what should we do with that light? Jesus said (second voice) "No one lights a candle and puts it under a bowl; instead he puts it on the lampstand, where it gives light in the house. In the same way your light must shine before people, so that they will see the good things you do, and praise your Father (God) in Heaven." Jesus does not want us to hide the light that we have but to let it shine out to others. We can do this as we follow carefully the things that Jesus teaches us in His Word (the Bible). We can love other people and help them with their needs. We can tell other people about Jesus and what He has done for them. If we do this the Light of Jesus will shine out from us and will bring light to others. for a long way (a mile). This made the Israelite people very angry. They often wanted to fight the Romans and pay them back for their evil ways. But Jesus taught the people to do something different to that. Jesus said, (second voice) "Do not take revenge on someone who wrongs you. If anyone strikes you on the right cheek, let him strike your left cheek too ... And if one of the soldiers forces you to carry his pack one mile, carry it another mile ..."
Jesus was asking the people to do something that they normally wouldn't want to do. Jesus knew that if people try to take revenge, or fight against those who do wrong to them, that it only leads to more fighting. Jesus wanted to change that. He wanted people to do good things, even to people who were bad to them. We know what that is like don't we? Many times we see people doing evil things to other people, and then the other people try to pay them back with something evil also. It happens to us too. People do wrong to us and we want to fight against them. But if we are Jesus' followers, we must think carefully about what He said. Jesus said, (second voice) "Now I tell you: love your enemies, and pray for those who persecute you. In that way you will be acting as true children of your Father (God) in Heaven." Another teaching in the Bible says: "Ask God to bless (help) those who persecute you. If someone does evil to you, do not pay him back with evil. Try to do what all people consider to be good. Never take revenge, my friends; leave that to God, for He has said that He will repay those who deserve it. Do not let evil defeat you; instead, conquer evil by doing good." If we want to live like that it will not be easy, but God will help us. If we are His followers, then He lives in us, and He can make us strong to do these good things. When we pay back evil by doing good, people will notice that, and they will know that we belong to Jesus. Then they will praise God for the good things we are doing. One thing we all like doing is talking to a friend. It is like that when we talk to God. We know that God is very great. He made everything we can see or know. He rules over every country and government. God also loves and cares for each one of us. God knows our names and everything about us. If we are followers of Jesus then God makes us one of His children and brings us into His family. This means we can talk to God as our own Father. God is ready to listen to us at any time and at any place. Jesus talked to His disciples about how they should pray to God. Jesus said that some people go out in the street where many people can see them, and then they make long prayers to God. They do this so that people will praise them and say that they are important. God is not pleased with that sort of praying. Those people are not praying to God, they are only trying to make other people pay attention to them. Jesus said , "Don't pray like that; when you pray, go away quietly by yourself, and talk to God on your own". We don't need to make long prayers to God. He knows all about our needs even before we ask Him. (Jesus said that) when we pray we should praise God and call His Name great. We should pray that God will come and rule in the hearts of people everywhere, so that people will love and obey Him here on earth just like they do in Heaven. We should ask God to provide for us the food we need for each day. We need to ask God to forgive us for the wrong things we have done and at the same time we must be prepared to forgive others who have done wrong things to us. Ask God to make us strong when the times of testing come, and keep us safe from the attacks of Satan. Let us always remember that God is very great, and that He loves and cares for us. Are you one of God's family? Then remember that God wants us to come and talk with Him as to a Father. He is ready to listen to us at any time. When you pray, don't do it just to make other people think you are important. God is not pleased with that. Talk to God as your friend, and also, listen carefully to what He has to say to you. 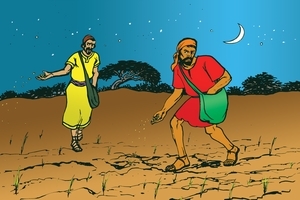 A man and his helpers planted good seeds (plants) in a field. One night (shortly after this), some of the man's enemies came to his field. They planted weeds all in among the good plants and then ran away. Later, the good plants grew up, but so did the weeds. The man and his helpers were upset about this. They said, "Some enemies have done this to spoil the crop". The helpers said to the man, "Will we go and pull out all the weeds?" But the man said "No; if you pull out the weeds now, you will pull out the good plants too. We must let both good plants and weeds grow together until the time of harvest. Then, at harvest time I will tell my helpers, "Collect all the weeds first, and tie them up in bundles ready to burn. Then collect the good plants and store them in my barn. (First voice.) Can you work out the hidden meaning of the story? 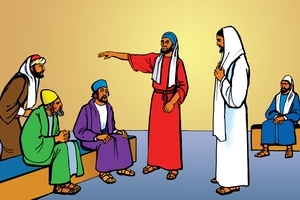 Jesus' disciples and the other people listened carefully. They found it difficult to understand what was the true meaning of the story. Later, Jesus explained it to His disciples. Did you work out the true meaning of the story? Remember that this story is God's message for us. We must make sure that we are members of God's family. Then we will be ready for that day when God comes to gather together all the people who have rebelled against Him, and send them to the place of fire. We will be ready to stay with God in Heaven that He has prepared for us. good things that the disciples could learn by observing what children did. Children did not try to take an important place for themselves. They trusted their parents and obeyed them. Jesus wanted His disciples to be like this. One day some women brought their children to Jesus. They wanted Jesus to put His hands on them and pray for them. However, Jesus' disciples tried to stop the women and children going to Him. 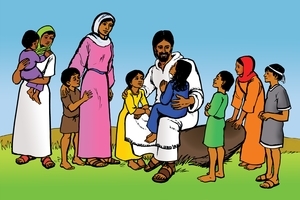 Jesus saw what was happening and said, "No, let the children come to me. (Children are a good example for us to follow.) If people want to become followers of God (enter God's Kingdom) they must become like little children. They must be humble and just trust God to save (help) them." At another time Jesus' disciples talked to Him about who were the great (important people in God's Kingdom (the place where God rules). Jesus took a small child and stood him in the middle of all the grown up people. Then He said that for people to even enter God's Kingdom (become one of God's people) they had to change their thinking and become like little children. They should not think that they are important themselves and so should be give a place in God's Kingdom. No, they should realize that they are not great in God's sight; they are sinful people, and they must simply trust God to save them. If they want to be great people in God's Kingdom, then they must keep on being like little children. They must think of themselves as being not important, trust God to help them at all times, and carefully obey the things He asks them to do. Then they will be great people in God's sight. (can use second voice.) A man had a flock of one hundred sheep. One of the sheep wandered away and became lost. What do you think the man will do about that lost sheep? I will tell you. He will leave the ninety-nine sheep in safe keeping and go and search for the lost sheep. Then, if he finds the lost sheep he will be very happy. He will be happier about finding the lost sheep than about the ninety-nine sheep that didn't ever wander away. 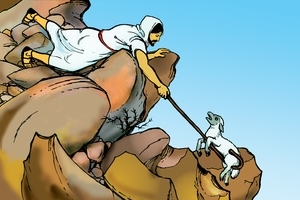 He will carry the lost sheep back home on his shoulders and then call together his friends to celebrate with him ..." In the same way, God is not happy for anyone to wander away from God and become lost, (especially young children). But if a sinful person, who has wandered away from God, changes his ways and turns to God, then God is very happy. And everyone in Heaven is happy too! Jesus said that He is like a shepherd looking after sheep. But the sheep that He looks after are people. Jesus said that He is the Good Shepherd who gives His life for the sheep. Jesus gave His life for all people when He died on the cross. He did this to pay the penalty for our sins. Now, if we will trust Jesus to save (help) us (and carefully obey His teaching) then He will take away our sin. Jesus will bring us into God's family and we will become one of God's people. We become one of God's sheep. Jesus said there are many, many people who are still not in God's family. They are like lost sheep. Jesus told His disciples to go to all parts of the world and tell people His good message. Jesus wants His disciples to find all the lost sheep and bring them to Him. If you are one of Jesus' disciples then you need to think carefully about this. We need to think about how we can bring some of these lost sheep to Jesus. Perhaps they are some of your friends and relatives. Perhaps they are people who live (in a village) near you. We need to be like Jesus and go out and find these lost sheep and bring them to Him. (Second voice). At one time a king (leader) was trying to straighten out matters with people who owed him money. A man was brought before the king who owed him a huge amount (many millions of dollars). There was no way that the man could repay this huge amount to the king. So the king told his servants to sell the man as a slave, along with man's wife and children and all his possessions. That way the king would receive some payment towards the money owed. But the man fell on his knees before the king and pleaded with him. "Be patient with me, and I will pay it all back", he said. The king felt sorry for the man and forgave him all the amount that he owed (said he did not have to pay back any of the money). Then the king let him go. The man left the king's house and soon after met one of his fellow workers who owed him a small amount of money. This man grabbed his fellow worker by the throat and began to choke him. "Pay back what you owe me", he said angrily. His fellow worker fell on his knees before the man and pleaded with him "Be patient with me and I will pay it all back", he said. But the man would not listen to him and had him put in jail until he could get the money repaid to him. Some other fellow workers saw what happened and they went out and told the king. When the king heard what had happened he was very angry. 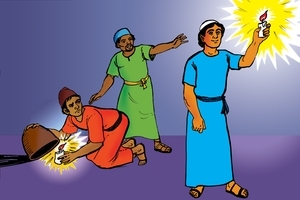 He told his servants to bring the man to him, and then he said, "You wicked man! I was sorry for you and I forgave you that large amount that you owed me. You should have been sorry for your fellow worker and forgiven him too." Then the king told his servants to put the man in jail until everything that he owed had been paid back. Jesus then said to His disciples, "This is how God, your Father in Heaven, will treat you unless you each forgive your brother (fellow man, people you live with,) from your heart (sincerely, genuinely). (First voice) Jesus was very clear in the teaching he gave to His disciples. If other people do wrong things to us, we must be ready to forgive them, and keep on forgiving them. This is not easy for us to do, because we often feel like paying back people with something bad and hurtful when they do wrong to us. However, we must remember just how much God loves us and how he has forgiven us for all our sins. If we are Jesus' disciples then he lives in us by His Spirit. He is able to make us strong to forgive others and to pay back people with good deeds when they do wrong to us. with nothing to do. He said to them, "You go to my harvest field too, and I will pay you a fair wage," and off they went. Two more times, later in the day, he went out and found other men to come and work for him. Finally, late in the day, (at five o'clock) he went out again and found some other men still without work to do. He sent these men also to work in his harvest field. At sunset, the landowner said to his foreman (work manager), "Call all the workers in and give them their pay. Start with the workers who began last and finish with those who started work first." So the people who started work late in the day came to the foreman and he gave each of them a silver coin. Then the foreman paid all of the other workers, and gave each of them the same amount, a silver coin. The men who had begun work early in the day started to complain. They thought that they should receive more pay because they had worked much longer than the others. However, the landowner said to them, "I have paid you exactly what we agreed on, so you can't say that I am being unjust to you. I want to give all the other workers, even those who came last, the same amount of pay, I have the right to do what I want with my own money. Will you be angry with me because I am being generous to these other workers? And then Jesus said to His disciples, "in the same way, many who are last now will be first then, and the first will be last." 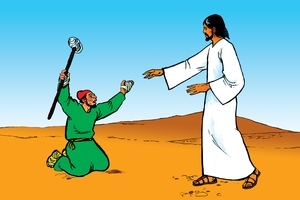 Jesus told this story to His disciples to show them that God is very generous. God gives many good gifts to those who love and obey him. If we turn away from our sins, come to Jesus and ask Him to take away our sins, then God will do that. He will take way (forgive us) all our sins. Jesus will come to live in our hearts by His Spirit, and He promises never to leave us. This means that we will live forever with Jesus. Because Jesus lives in us He can make us strong to do all the things that please God. God also brings us into His family and makes us one of His own children. When God does all these things for us then we are very happy. God does the same things for all people who love Him and obey His word. He does not do less for one person than another. And it doesn't matter if a person has been a follower of Jesus for a short time or a long time. God does the same good things for them all. Some people think that because they are wealthy or important people in the world now, then they will also be important in God's kingdom (the place where God rules) later on. But Jesus said that it is the humble people, who love God and obey Him, who will be the important people in God's kingdom. People may think that they are last now, but later on they will be first. The disciples of Jesus asked Him many questions about when the world would end and when He (Jesus) would come back to the world from Heaven. Jesus told them about many things that would happen in the future. Many of these things were not pleasant. They were quite different from what the disciples had expected. (Jesus told them that Jerusalem would be destroyed, that there would be wars between many nations, and that people all over the world would experience times of great trouble.) Jesus said that He would come back to the world from Heaven, but only God the Father knew when that time would be. The important thing was that they should be ready to meet Him when he did return. Jesus told them some stories to help them remember this. Here is one of them. This is the story that Jesus told: There were ten young women who went out to the roadside to wait for the bridegroom and bride to come. It was night time and they all had their lamps so that they would be able to join in the procession. Five of the women were wise, and they had brought extra oil with them for their lamps. Five of the women were foolish, and they did not bring extra oil. The women waited for a long, long time, and finally they went to sleep. Then at midnight they heard a shout: "Wake up! Here comes the bridegroom. Go out and meet Him now!" All the women got up quickly and got their lamps ready. Then the five foolish women found that they had no oil for their lamps. They asked the five wise women to give some of their oil to them. But they said that they could not do that or they might not have enough, to go into the wedding feast. They told the five foolish women to go quickly to the store and get the oil they needed. They went off to do that, but while they were away the bridegroom arrived. All the people in the wedding procession went into the bridegroom's home for the feast, and then they shut the door. 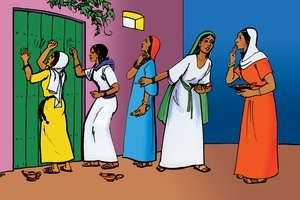 Later the five foolish women came back and called out to the bridegroom inside the house, "Oh Sir! Open the door and let us in too (please)." But he replied "I don't know you. You can't come inside." Jesus told this story, then he said to His disciples, "Therefore you must always be alert. Be prepared for the time when I will return, for you don't know when that time will be." Jesus taught his disciples that later on He would return to the world from Heaven. While they were waiting for Him, He wanted them to make good use of all the things God gave them. Jesus told them this story. (Second voice) A wealthy man was going on a journey to a far country. 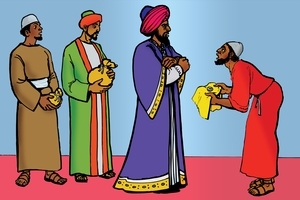 He called his servants together and gave each of them some of his money. He wanted them to use the money to make more money for him. He gave five amounts of money to one man, two amounts to another man. (Each man received money according to his ability to use it.) Then the wealthy man went away on his journey. The man with five amounts of money went straight to work with it and eventually he earned another five amounts. The man with two amounts of money did the same and he earned two more amounts. But the man with one amount went and dug a hole in the ground and hid the money there. (so that it wouldn't be lost or stolen.) After a long time the wealthy man returned from his journey. He called all his servants together to see what they had done with the money he had given them. The servant who had received five amounts of money came and spoke to his master. "Sir, you gave me five amounts of money. Look, here are another five amounts of money that I have earned." His master said, "You have done well. I gave you a small amount of money and you have worked well with it, just as I asked you to. Now I will put you in charge of many things. Come and share in the joy of your master." The man who had received two amounts of money came and told his master how he had made another two amounts. His master was very pleased and told him the same things as he had told the man with five amounts of money. Then the man who had received one amount of money came and spoke to his master. "Sir, I knew you were the sort of man who reaps crops from places where he has not sown seed, and I was afraid you would take from me any money that I earned. So I hid your money in the ground, and here it is, just as you gave it to me." The wealthy man was very angry and said, "You are a wicked and lazy servant. If you thought I was that sort of person you should have put my money in the bank, so it might have gained some interest (more money) for me. Take the money from this man, and give it to the man with five amounts of money. For the man who uses well what he has been given shall be given more. But the man who does not use well what he has been given, even that small amount will be taken from him. Send that wicked, lazy servant away. He will be punished." (First voice) Jesus is like the wealthy man who went away on a journey. We who are followers of Jesus are like the servants. God has given each of us the ability to do different things well. Some of us are good at making things; some of us are good speakers; some of us are good at helping others. There are many different things that we can do that will help others to know about Jesus. Jesus wants us to work well at these things and not to get tired of telling others about Him. Jesus will be very displeased if we do not use the things that God has given us, or if we hide the message of God from others. If we do well the things that Jesus has asked us to do, then when He returns to the world, He will be very pleased with us and we will share in His Joy for ever. Mark was one of Jesus' friends. He wrote down many of the things that Jesus said and did. We will listen to some of these stories now. Mark tells us that Jesus cared very much about people, especially those who were poor and outcast. He also tells us how Jesus used His great power (as God's Son ) to help people, as He healed many people of their sicknesses. Mark begins his book by telling us about a man called John. John was sent by God as a special messenger (prophet) to the Israelite people. John lived by himself, away from the towns, out in the desert. But great crowds of people came to hear his message. Then Jesus came to see John. Jesus had not started telling God's message to others yet. 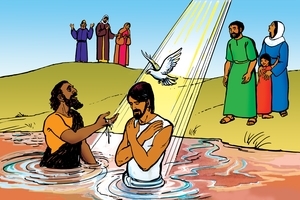 Jesus asked John to baptize Him. John was surprised that Jesus asked him, because Jesus had never done anything wrong. Jesus wanted to show people that He was a man who was obedient to God, and that He was going to please God in everything He did. He also wanted to show people that He was beginning His work as God's man to help people. So John baptized Jesus in the river Jordan. As Jesus was coming up out of the water, people saw God's Spirit come down gently on Jesus in the form of a dove. Then they heard God's voice speaking to Jesus from Heaven. God said, "You are my Son, whom I love. I am very pleased with you." Yes, Jesus was a man who obeyed God, but He was also God's Son, and everything He did pleased God. Jesus was ready now to begin His work of telling God's message to people, and of using His power to help people. You listen and you will hear some stories about the wonderful things He did. God had sent Jesus to do a special work. Now Jesus began His ministry (work). He went through all the places in Israel, teaching the people about God. He said, "Now is the time for you people to come to God. Turn away from your sins and follow (obey) this good message that I am giving you." Jesus also did many wonderful things to help people. Jesus also wanted other people to do this work with Him. One day Jesus was walking along the shore beside the lake of Galilee, and He saw some men that He knew. Peter and Andrew were brothers, and they were fishermen. They were throwing a net out into the sea to catch some fish. Jesus said to them, "You come and be my followers (be my disciples, work with me). I will teach you how to catch men (and make them followers of God). So Peter and Andrew left their fishing nets behind and went with Jesus. Jesus walked on a little further and came to two more men, who were getting their nets ready for fishing. Their names were James and John. Jesus talked to them and asked them also to come with Him and to be his followers. Straight away they left their nets and their boat and went with Jesus. There were many people who followed Jesus to listen to His teaching, and to see the wonderful things He did. Jesus chose twelve men to be His special followers (friends, disciples). 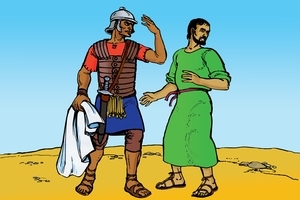 (Their names were: Peter; James; John; Andrew; Philip; Bartholomew; Matthew; Thomas; James, son of Alphaeus; Thaddaeus; Simon the Zealot; and Judas Iscariot.) These twelve men stayed with Jesus all the time. Jesus taught them about God the Father, God the Spirit, and about Himself. He taught them that He was God's Son and showed this was true by the many great things He did. He also taught them that He was going to die on a cross as a payment for the sins of all people, but that he would rise from the dead after three days. Jesus taught men so that they could go and teach others. Jesus wanted people all around the world to hear His message. Today too, Jesus wants people to be His followers and work with Him. Jesus wants men and women, boys and girls, to be His disciples. Jesus wants us to study His word so that we know all about Him, and He wants us to tell other people about Him. Jesus said that if people want to be His disciples they must forget about pleasing themselves and think instead about pleasing others. We must also be prepared to suffer hardship, just as Jesus did. If we love Jesus and want to please Him most of all, then this will not be too difficult for us to do. Remember, being a disciple of Jesus is the best thing that we could ever be. Jesus continued to travel from place to place, teaching the people about God. One day a man came to Jesus and knelt in front of Him. This man had a terrible skin disease called leprosy. Because the man had leprosy the people made him leave his home and family and go away and live by himself. He was not allowed to go near anyone, and if anyone came near to him he had to shout, "Unclean! Unclean!" and make people stay away from him. People were very frightened to go near a leper in case they caught the terrible disease too. At that time there was no way that leprosy could be cured. Eventually this disease would make the man die. Jesus didn't run away from this man. Jesus showed great love for this man and came close to him. The man believed that Jesus could help him and so he said to Jesus, "If you want to, you can make me clean." (heal my leprosy). Then Jesus did something that no one ever did. He reached out and touched the man. Jesus said to him, "Of course I want to help you. Be clean!" As soon as Jesus said that, the man's leprosy was cured. His skin became clean and good again and he was able to go back and live with his family and friends That man was very happy indeed. Jesus was able to do this great miracle (work) because He is God. He is the one who made all things, and He has power to cure any sickness that people have. Jesus loved that man and wanted to help him. Jesus loves each one of us too. Jesus knows about the sin that is in our hearts, but He still loves us and wants to help us. Sin is like that terrible skin disease of leprosy. Sin makes unclean in the sight of God, and sin separates us from God. (because He is holy). If we come to Jesus He will reach out to us and help us. If we ask Him to, he will take away our sins and make our hearts clean. But if we want Him to do this we have to turn away from our sins, and do the things He tells us in His word. Jesus was staying in a place called Capernaum, just by the lake of Galilee. People heard that He was there and soon a great crowd of people came to his house. There were so many people that no one could even get in the door. They all listened carefully as He taught them about God. A group of people came up to the house, and four of them were carrying a man who was paralysed. They wanted to take the man to Jesus, but because the house was so crowded they couldn't get inside. However, this didn't stop them from trying to get to Jesus. They carried the paralysed man up the steps at the side of the house and onto the (flat) roof. They made a big hole in the roof, just above where Jesus was located. 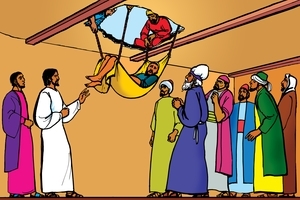 Then they lowered the man down on his sleeping mat, right in front of where Jesus was standing. Jesus was not angry with them for doing this. No, He was pleased. Jesus could see that these people really loved their friend who was paralysed. He could also see that they believed that He (Jesus) could help them. So Jesus said to the paralysed man, "Your sins are forgiven!" The people had not expected Jesus to say that. They thought He would have said something about the man's sickness. Some of the people there were religious teachers. "Who does this man think he is? God is the only one who can forgive sins. This man is not God. He is only a man." Jesus knew what the religious teachers were thinking, so He said to them,"You don't believe that I have the power (authority) to forgive people's sins, do you? But which would be easier for me to do; to say to this man that his sins are forgiven, or to tell him to get up and walk? So I will prove to you that I do have authority to do both of those things." Then Jesus spoke to the paralysed man and said, "Get up now. Pick up your sleeping mat and go home1" The man got up straight away, picked up his mat and walked through the crowd. The people were very astonished when this happened. They had never seen anything like this before. They praised God that such a great miracle (work) should happen to this man who was paralysed. Now they knew that Jesus had great power to heal people who were sick. They also knew that He had the power to forgive people's sins. Jesus was a man, but He was also God, and He had the power (authority) to do the things that He said. Perhaps you feel like the man who was paralysed. You don't have any power to do the things that are good and right. If you ask Jesus, He can forgive your sins and make you strong to do the things that please God. This is the most important thing that can happen to you. Many years before, God had given some laws to the Israelites through one of their great leaders, Moses. These laws helped the people to understand about God and to live good lives. But some of the Israelite teachers added many more laws. Many of these laws were about the Israelites special (holy) day, the sabbath, which was the last day of the week, Saturday. The Israelites were not allowed to work on the Sabbath, and there were many other things that they were not allowed to do. Many of them forgot that there were lots of good things that they could do on that day. One Sabbath (Saturday) Jesus was in the meeting house with many other Israelites. One of the men there had a hand that was crippled (withered). Some of the Israelite leaders were there and they watched Jesus closely to see if He would heal the man. They thought it would be very wrong for Jesus to do this, because it would be like working on the Sabbath. These people didn't really care about the man who was crippled. They thought it was more important that people should obey the Israelite rules. Jesus spoke to the man with the crippled hand and asked him to stand out in front of all the people. Then Jesus Spoke to everyone. He said, "what does our Law allow us to do on the Sabbath? To help people or to harm them? To save a man's life, or to destroy it?' The people realised that what Jesus was saying was right, but they didn't want to admit that the way they kept some of their rules was wrong. So nobody answered Jesus. They said nothing. This made Jesus angry, as He saw that these people had so little love for the man who was crippled. Then Jesus said to the man with the crippled hand, "Stretch out your hand!" The man did that, and straight away it was restored (made good again), and was just as good as his other hand. The man was very happy, but some of the Israelite leaders were very angry at what Jesus had done. They began to make plans about how they could get rid of Jesus. We would agree that these men were wrong to have so little feeling (love, pity) for the man with the crippled hand. But sometimes we are like that too. We say that other people should follow God's Word in exactly the same way that we do. If they don't, we say that they are wrong, and sometimes we become angry with them. We should remember that Jesus showed us that caring for people is more important than keeping rules. It is very important that we follow God's Word correctly, but if we do that it should not keep us from loving and helping others. No, rather it should help us to love and care for others even more. Jesus was by the lake of Galilee and was teaching the people about God. Soon many people were there listening, and they crowded in on Him. So He got into a fishing boat just near the water's edge and taught the people from there. At the end of the day Jesus was very tired, and wanted to get away from the crowd. So He said to His disciples, "Let's go over to the other side of the lake". They agreed, and they all set off in the boat. 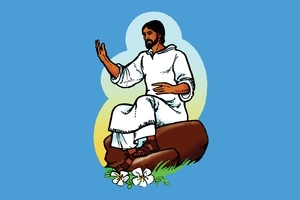 Jesus settled Himself down in the rear of the boat to have a sleep. Then a fierce storm struck the boat. The waves became very rough and so much water came into the boat that it was ready to sink. 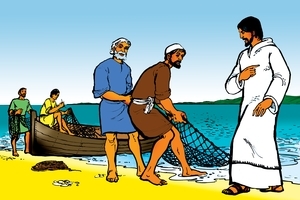 Many of the disciples were fishermen. They had sailed on this lake for many years and they knew all about storms, but this storm was too strong for them. They became frightened and thought they would soon die. They were upset that Jesus was still asleep, so they woke Him up and said to Him, "Teacher, look at this storm! We are all about to drown and You are still sleeping. Don't You care what happens to us?" Jesus got up and spoke to the wind and the waves. "Quiet! Be still! ", He said. Immediately the wind died down and the sea became calm. Then Jesus spoke to His disciples, "Why are you so frightened? Don't you have faith in Me yet?" The disciples were astonished and still frightened. They had never seen anything like this before. They said to each other, "What sort of person is Jesus? He is much greater than we ever realized. Even the winds and the waves do what He says!" The disciples were beginning to learn about Jesus. They had heard His message, and had seen some of His great miracles (works). They were starting to understand that Jesus was much more than an ordinary man; that He was indeed the Son of God. He was the One who had authority (power) over all things, which He Himself had created. They were starting to learn that in times of great trouble and difficulty they could trust Jesus to help them. Jesus is just the same today. If we are His disciples (followers) then He is a friend who is ready to help us. But what a friend He is! He has great authority (power) over all things, and He has great power to help us. Sometimes we have difficulties and trials. 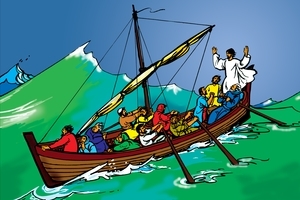 (These are like the storm that came upon Jesus and His disciples in the boat.) Jesus knows all about these things that happen to us. He can take away our fears and bring peace to our hearts. Jesus and His disciples came back across the lake in the boat. A big crowd of people was there to meet them when they arrived. One man came straight away to Jesus and fell at His feet. This man's name was Jairus. He was the leader of the synagogue (place where the Israelites met to worship God). Jairus told Jesus that his twelve year old daughter was very sick, and he asked Jesus to come quickly and heal her, or else she would die. 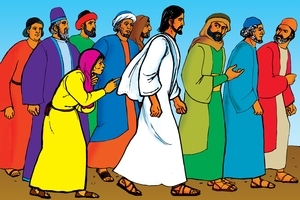 Jesus and His disciples set off with Jairus to go to his house, and a big crowd of people went with them. There was a woman in the crowd who was very sick. She had suffered from severe bleeding for 12 years. She had been to many doctors and had spent all her money trying to get better. Instead, her sickness only got worse. She had heard about Jesus and came to see if He could help her. Now she had seen Jesus she felt sure He could help her. But she was too embarrassed to speak openly about her sickness. (The Israelite law said that she was ritually unclean, and any one she touched would also be ritually unclean for 7 days.) This woman believed that if she could just touch a part of Jesus' coat, then she would be well again. She thought she could do this in the crowd and no one else would know. So as the crowd moved along the woman moved closer and closer to Jesus . Then she reached out and touched Jesus' coat. Straight away her sickness was cured (the bleeding stopped). The woman was very happy that she had been made well, and she was also pleased that no one seemed to have noticed what she had done. Then Jesus stopped and looked around. He knew that power had gone out from Him to heal someone. Jesus said, "Who touched my coat?" Jesus' disciples were surprised to hear Jesus ask this question, because so many people were crowding around Him and touching Him. However, Jesus kept looking at the people around Him. The woman realized that she could not hide herself any longer. She came trembling with fear and knelt at Jesus' feet. She told Jesus everything that had happened. Jesus was not angry with her; no, He was very pleased to hear what she had done. Jesus said to her, "Daughter, (suitable greeting) because you believed in Me (that I could heal you) you have been made well. So, don't be upset (concerned). Go home in peace and be free from your trouble (sickness). Jesus showed the people that He had the power to cure sickness. He also showed that He knows about the things that people like to keep hidden. Perhaps there are things in your life that you want to keep hidden from other people. Things that are not sicknesses, but are the bad actions and thoughts that we would be ashamed to tell to others. Jesus knows all about these things and He wants to help us. We can come to Jesus, tell Him about these things, and ask Him to take away our sins. He will do this, and He will make us strong to do the things that please God. We must have faith in (believe in) Jesus just like the woman did. We must tell Jesus about these things and trust Him to help us. 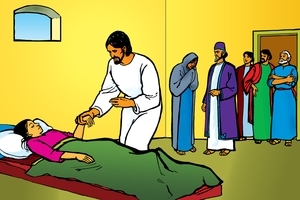 (Jesus had just healed a woman who had been sick with severe bleeding, and He was talking to her.) Jairus was the leader of the local synagogue and he was waiting for Jesus to come to his house. Jairus' daughter was very sick. 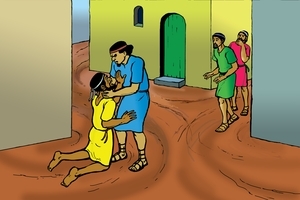 Just then some servants arrived who had come from Jairus' house. They said to Jairus, "Your daughter is dead. There is no need any more to ask the Teacher (Jesus) to come." Jairus was very sad when he heard this, but Jesus said to him, "Don't be frightened by what they have said. You must continue to believe that I can still help your daughter." Then Jesus stopped all the people from following Him any further. 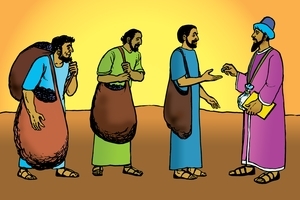 He took with Him only three of His disciples, Peter, James and John, as well as Jairus, and they went on to Jairus' house. 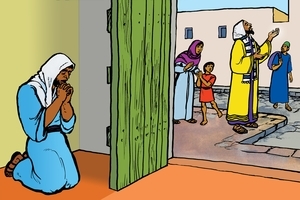 When they arrived at Jairus' house, there were many people there. They were all crying loudly and making a lot of noise, because the girl was dead. Jesus went into the house and said to the people, "Why are you making all this noise and crying? The girl is not dead, she is only asleep." The people were not happy to hear this from Jesus, and they laughed scornfully at Him. So Jesus made everyone leave the house except Jairus and his wife, and His three disciples. They went into the room where the girl was lying in bed. Jesus went up to her, took her hand and said. "Little girl, I tell you to get up!" Straight away the girl jumped up and walked around the room. Her parents were very astonished and happy. Jesus told Jairus not to tell everyone about what had happened, but to keep it quietly to themselves. He also told them to get some food for the girl to eat. This story helps us to understand that Jesus' power is very great. He is able to bring dead people back to life. Jesus' power can help us too. Many times we are frightened of what will happen when we die. Sometimes we are sick, and we are afraid that we will die. Sometimes we are afraid that people will perform sorcery against us, or that evil spirits will attack us, so that we will die. (Use local illustrations.) Jesus has promised that if we love Him and obey His teaching He will give to us eternal life. This means that Jesus sends His Spirit to live in our hearts and to stay with us for ever. When our bodies die Jesus takes us to be with Him in Heaven for ever. Jesus is stronger than Satan and all the evil spirits, so we do not need to be afraid of them. Jesus' power is greater than the grave, so we do not need to be afraid of dying. Remember the words that Jesus said to Jairus, "Don't be frightened, ... continue to believe!" Large crowds of people kept coming to Jesus everywhere He went. They listened to what He said and watched to see if He would do some great miracle. This made it very difficult for Jesus and His friends to get any rest. 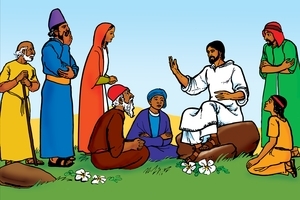 It was also difficult for Jesus to sit only with His disciples and teach them. So Jesus and His friends went on a long walk to another country next to Israel. They went to a place called Tyre and stayed there in the house of a friend. Even there people heard about Jesus and came to see Him. A Greek woman came to Jesus. She was not an Israelite. And normally the Israelites would not have anything to do with Greek people. This woman had a daughter who was possessed by an evil spirit, and she was very worried about her. She came and knelt in front of Jesus and pleaded with Him to drive the evil spirit out of her daughter. At first Jesus did not speak to her, but she kept on asking Jesus to help her daughter. Then Jesus said to her, "I came to help the Israelite people. If I help you, it would be like a father giving his children's food to the dogs." Jesus really loved this woman and her daughter, and He wanted to help them. He was testing this woman to see if she really believed that Israel's God could help her. 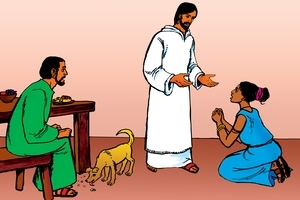 The woman said to Jesus, "Yes, that is right (not to give the children's food to the dogs) but even the dogs eat the crumbs (scraps) that fall from the table." Jesus was very pleased with what the woman said, and He said to her, "That was a good answer. Now I know that you do believe very strongly that God can help you. I have done what you have asked for, and you can go home now. I have driven out the evil spirit from your daughter." The woman was very pleased and went back to her home. There she found her daughter lying quietly on her bed, and the evil spirit had left her. This story helps us to understand how God loves all people. Sometimes we find it very difficult to like people who live in other countries and who are very different from us. God is not like that. God loves all people in all countries. All people must come to God in the same way. They must believe that God is the one who can help them, and that He can help them only through His Son Jesus. If we love Jesus and obey His teaching, then we are brought into God's family, and it doesn't matter what country we come from. We learn from this story too, that Satan is trying to control people everywhere. But Jesus' power is much stronger than Satan's. If we are prepared to come to Jesus and ask Him to help us, Jesus can free us from the power of Satan wherever we are. Jesus can bring peace to our hearts, and He can help us to live a life that pleases God. Jesus and His disciples left the place of Tyre and came back to the lake of Galilee. On the way they met a group of people who brought a man to Jesus. This man was deaf and could not speak properly. The people urged Jesus to lay His hands on the man to heal him. Jesus knew that the man would feel embarrassed with so many people standing around and staring at him, so He took the man away from the crowd by himself. 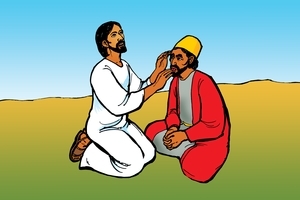 Then Jesus put His fingers gently in the man's ears. He also spat on His fingers and touched the man's tongue. Jesus looked up to Heaven, and gave a deep sigh, because He was very sorry for the man. Then He gave a command, "Open!" Straight away the man could hear clearly, and he could also speak properly. The people were amazed and happy to see what Jesus had done. Jesus asked the people to keep all these things quietly to themselves, but instead they kept on telling other people. They kept saying, "Everything that Jesus does, He does very well! He can even make deaf people hear, and dumb people speak. (He must be the man the prophets spoke about many years ago. He must be God's chosen man, the Messiah.)" The people were very excited to see what Jesus did to that man. We know how important it is to be able to hear clearly and to speak properly. It is good to know that Jesus' power is so great that He could help this man with his problem. It is even more important for each of us to be able to hear clearly the Word of God, and for each of us to be able to speak clearly to others about Jesus. Perhaps we need to ask Jesus to touch our ears so that we can hear God's word clearly. Perhaps we need to ask Him to touch our tongues so that we can praise God and speak clearly to others about Him. (Jesus and His disciples came to a place on the shore of the lake of Galilee, called Bethsaida. This was the home village of Peter and Andrew, James and John, who were some of Jesus' disciples.) Some of the people brought a blind man to Jesus. 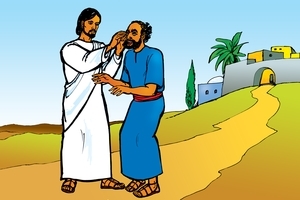 They asked Jesus to touch the blind man so that he could see again. Jesus took the blind man by the hand and led him out of the village, away from all the people. When they were in a quiet place, by themselves, Jesus took some of His saliva and put it on the man's eyes. Then He put His hands on the man's eyes and said, "Can you see anything now?" The man looked around him and said, "Yes, I can see people (but I can't see them clearly). They look like trees, only they are walking around. Jesus put His hands on the man's eyes again, and then the man could see everything very clearly. The man was amazed and very happy. 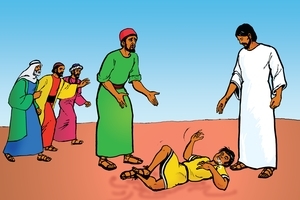 He wanted to rush off and tell everyone what Jesus had done, but Jesus told him to go straight back to his own home, and not even to go into the village. Jesus knew that if the man went into the village it would cause a big commotion, and this would make it difficult for Jesus to help other people. The man was so happy that he could now see everything around him. Before, he had been in darkness, and it had been difficult for him to do anything. Now he could see! It is the same for us when we come to know Jesus. If we love Jesus and carefully obey His teaching, then He brings His light into our hearts and minds. Jesus teaches us from His word, the Bible, so that we can see what are the right things for us to do. Jesus leads us by His Spirit and we follow the ways that He knows are best for us. Jesus said. "I am the light of the world, anyone who follows me will not walk in the darkness." When we are walking in the light with Jesus, then we can see clearly to show His way to other people. We can bring people to Jesus, just like the people of Bethsaida brought the blind man to Him. Jesus went with three of His disciples, Peter, James and John, to another place. The other disciples were together and a man brought his son to them. The man was worried because his son was possessed by a dumb evil spirit. The disciples tried to cast out the evil spirit, but they couldn't. Soon a big crowd of people gathered and some of them started to argue with the disciples. Just then Jesus came to them with Peter, James and John. Jesus said to the people, "What is the trouble?" The father of the boy came and spoke to Jesus. I brought my son to you so you could heal him. He is possessed by a dumb evil spirit that throws him onto the ground, so that he foams at the mouth, grinds his teeth and his body becomes rigid. I asked your disciples to cast out the evil spirit, but they couldn't. Jesus spoke to the man and to His disciples and said, "The problem is that your faith in God is so small. (You don't believe that God has enough power to help you.) Bring the boy to me!" So they brought the boy to Jesus. When the evil spirit in the boy saw Jesus, he made the boy fall to the ground and roll around, foaming at the mouth and grinding his teeth. Jesus said to the father, "How long has he been like this?" The father said, "Ever since he was a small child. Many times the evil spirit has made him fall into the fire or the water to try and kill him. Oh please take pity on us and help us if you can!" Jesus said, "If you really believe that God's power is very great, then it is possible for Him to do everything you can think of." The man said, "I do believe that God is able to help us, but my faith in God is very weak. Help me to have a strong faith in God." Jesus saw that many people were running towards them to see what was happening, so he spoke to the evil spirit in the boy, "Come out of him you deaf and dumb evil spirit, and never enter him again!" The evil spirit gave a loud scream, shook the boy strongly, and came out of him. The boy lay on the ground and some people said that he was dead. Jesus came and took him by the hand and helped him to stand up. Then the boy was quite all right. Everyone was amazed and happy when they saw what the power of God had done. Later, when all the people had gone away, Jesus' disciples asked Him, "Why couldn't we cast out the evil spirit?" Jesus said, "To be able to do this, you need to spend much time in prayer with God." This story shows us that Jesus' power is very great. Jesus is much stronger than Satan and all the evil spirits. Jesus is the Son of God, and has power (authority) over all things in this world. If we are people who love Jesus and obey His teaching, then Jesus lives in us and He wants to show His power through our lives (through the things we do and say). With our own strength we cannot overcome Satan and the evil spirits, and we cannot do the things that please God. God knows that we cannot do these things by ourselves. Jesus lives in us and He can help us to do and say the things that please God. He can give us the power to overcome Satan and the evil spirits. We need to spend much time in prayer with God so that we can get to know Him well. Then other people will see God's great power at work in our lives. GRN has recorded a version of this script in 449 languages and dialects. See full list. See different versions of this script in Afrikaans, Buhutu, Chinese Simplified, English: South African, French, Herero, Indonesian, Kimwani: Ibo, Lomwe: Mozambique, Malagasy Merina, Ngonde, Northern Sotho, Obo Manobo, Pijin: Solomon Islands, Portuguese: Brazil, Portuguese: Mozambique, Russian, Sena: Mozambique, Shimaore, Shona, Spanish, Swahili: Tanzania, Takwane, Tok Pisin: PNG, Tonga: Malawi, Tsonga, Umbundu, Urdu, Venda, Xirima, Yao: Malawi, Zulu.